Address: 2750 North Fork Hwy. 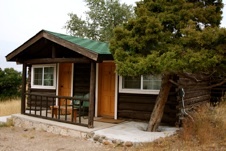 The Trail Shop offers fine dining and lodging in a beautiful western atmosphere. Open May thru September, the restaurant is open for dinner and private parties, the rooms are available for nightly or multi-night stays. Established in 1922 as a mid-way stop between Cody and Yellowstone, those on vacation and local residents today can enjoy Trail Shop’s beautifully restored lodge & bar, great western dining, 8 newly renovated rooms, specials for hunters and fisherman, and the grand beauty of the Wapiti Valley. All rooms have wireless internet access, flat screen televisions and a complimentary continental breakfast. No Pets.